A new culmination of the activities of the Indian Library occurred during the Fall 2006. Three new books, part of the project, were launched during the Book- and Library Fair in Göteborg (Bok- och Biblioteksmässan), held 21–24 September 2006. More information (in Swedish only). Detailed programme for events at Göteborg Book Fair 2006 (as a pdf file). In September 2008, a new set of Indian books translated into Swedish. The books and the writers (among them Mahasweta Devi) were presented at the 2008 Göteborg Book Fair. Read Lars Eklund’s report. At the 2009 Book Fair, an anthology with current Indian poetry was presented. The volume, entitled ”Innan Ganges flyter in i natten” has been edited by Tomas Löfström and Birgitta Wallin, and published by Tranan publishing house. A seminar, entitled ”Indiska versfötters väg till Sverige”, was organised on Friday 25 September by Indian Library, Tranan and Karavan. The Indian poet Anjum Hasan, and the Swedish poet Marie Lundquist, discussed the poems in the book, and also the workshop that preceded the publication of the book. This workshop was held in January 2009 in Calangute, Goa, India, and involved poets from both India and Sweden, including K. Satchidanandan, former Secretary of Sahitya Akademi. During workshop sessions, they translated Indian poetry from different languages into Swedish. More information. The Indo-Swedish Translation Project was started as a result of visits by Swedish writers to India in 1996 and Indian writers to Sweden 1997. Under the name Indienbiblioteket, the project was officially inaugurated by the Indian ambassador to Sweden, Ms. Chitra Narayanan, at Göteborg Book Fair in September 2001. It has since developed further with a number of new publications almost every year. 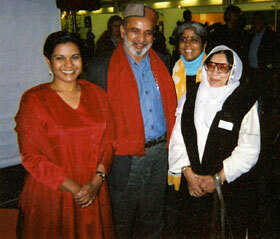 From the inauguration of Indian Library, in Göteborg 15 August, 2001. From left the Indian ambassador to Sweden  Ms Chitra Narayanan  and the authors U R Anantha Murthy, Teji Grover and Krishna Sobti. The project, initiated and managed by a small, independent group affiliated to the Swedish Writers' Union, is economically supported by Sida (Swedish International Development Cooperation Authority) and the Swedish Institute (maintaining cultural relations with foreign countries). The project also has close contacts and cooperation with Sahitya Akademi, the Indian literary academy, as well as other Indian organisations and publishing houses like Katha and Tulika. In Sweden the project cooperates with Karavan, a literary magazine dealing with literature from Asia, Africa and Latin America. translators, so that the translators will be able to meet colleagues, talk to the writer and easily get aquanted with the culture and nature in which the story of the book is set. The plans for the project span several years and include a number of books. In Sweden the books are published (by different publishers, e g Ordfront förlag and Tranan) as a series: Indiska Biblioteket (Indian Library). 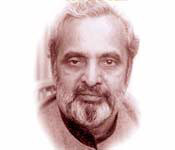 • U R Anantha Murthy: Samskara - Rit för en död man (Samskara - Rite for a Dead Man). Translation from Kannada:Vanamala Vishwanatha/Hans O Sjöström. Publisher: Indian Library/Ordfront. • Krishna Sobti: Lyssna min dotter (Ai ladki). Translation from Hindi: Chandra Ramakrishnan/Annika Persson. Publisher: Indian Library/Tranan. • Kärlek, uppror och kardemummakärnor (Love, Rebellion and Cardamon Seeds), edited by Birgitta Wallin and Tomas Löfström (anthology of Indian short stories in Swedish translation). Publisher: Indian Library/Tranan. The books were presented at Göteborg Book Fair, when U R Anantha Murthy and Krishna Sobti among others were present. See the program for the Indian writers at the Fair (in Swedish only). Kerstin Ekman's Blackwater and Torgny Lindgren's The Way of a Serpent, into Hindi and Kannada respectively. These two Swedish books were published in India in 2002 by Katha and Sahitya Akademi. The Indian poet Teji Grover has also edited an Anthology with modern Swedish Poetry, translated into Hindi. The title of the book would in Swedish be En doft av snö. Some of Teji Grover´s own poems has, by the way, also been translated into Swedish, and is published in an issue of the magazine Lyrikvännen. Pippi Långstrump by Astrid Lindgren has also been translated into Hindi and Tamil. This was a project in co-operation with the publisher Tulika in Chennai, and materialised in 2002.  Arundhati Roy: Priset för att leva. Essays. Translation Lars Andersson. Nya Doxa.  V S Naipaul: Ett halvt liv. Novel. Translation Rose-Marie Nielsen. Wahlström & Widstrand.  Radhika Jha: Lukt. Novel. Translation Britt Arenander. Natur och Kultur.  Vikram Seth: Golden Gate. Novel. Translation Caj Lundgren. Forum.  Jhumpa Lahiri: Den indiske tolken. Short stories. Translation Eva Sjöstrand. Forum.  Baldev Hundal and Bernt Ola Gustafsson: Indiska fabler. Warne.